BURNET — He was the most feared yet respected fighter pilots of World War I until his death in 1918: the Red Baron. He and his squadron, the Flying Circus, made life miserable for British and French fighters in the skies above the battlefields. By the time he was killed, the Red Baron had shot down 80 Allied planes. He’s gone now — or is he? On Saturday, Sept. 8, during the Bluebonnet AirSho, the distinct red and black plane returns to do battle over the Highland Lakes. This isn’t the original German fighter pilot; it's the Immortal Red Baron, a man who, according to the storyline, discovered the Red Baron’s plane in a barn. OK, it’s really not the Red Baron’s plane, and the pilot, who remains unnamed, isn’t possessed by the spirt of the World War I ace. What it is is an innovative way to provide a more exciting air show experience for people on the ground. After several years on the circuit, Trischuck and the Immortal Red Baron crew decided there was something lacking at the average air show. “Most of the people who go to air shows aren’t pilots and don’t fly so they don’t feel a part of the show, other than just watching it,” Trischuk said. To create a connection, the crew turned to people in the entertainment and marketing fields. “What really entertains people is either a story or some element of competition,” Trischuk said. After several years of research and work, they came up with the Immortal Red Barron act. The show combines a narrative, characters, and competition. And it brings in the audience through a ground-mounted machine gun. The story is about a man who uncovers a lost Red Baron plane in a barn then “becomes” the notorious World War I pilot when he climbs into the cockpit. Though the audience connection is through the character, the Immortal Red Baron isn't the hero of the story. He ambushes — his go-to form of attack — another pilot, the good guy, during the show. “It’s basically a good guy and bad guy engaged in aggressive dogfighting to the death,” explained the actor playing the Immortal Red Baron. (He keeps his identity concealed). The audience won’t know when or who the Immortal Red Barron will attack until it happens. On the ground, the crew will set up actual air raid sirens and a World War II-era belt-fed machine gun — with all the working parts removed. Propane is used to simulate machine-gun fire, and, during the show, some audience members will be able to “shoot” at the Immortal Red Baron. 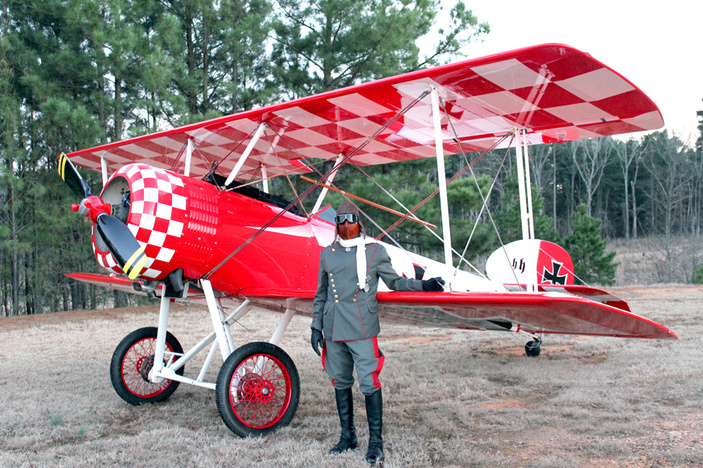 The Immortal Red Baron flies a custom-built biplane, a replica of a World War I fighter. Before the Red Baron flew his trademark Fokker Dr1 Dreidecker triplane, he piloted an Albatros D-series biplane, painted red. The Immortal Red Baron’s plane, however, has more horsepower and is designed to take the added G-forces of modern aerobatics. The plane features World War I-era machine guns, also propane-fired, so the crowd will hear its guns crackle across the sky as the pilot tries to “shoot down” his foe. As for who comes out victorious during the dogfight, you’ll just have to see. The Bluebonnet AirSho, hosted by the Highland Lakes Squadron of the Commemorative Air Force, is Saturday, Sept. 8, at Kate Craddock Field, 2302 U.S. 281 South in Burnet. Gates open at 9 a.m. The planes take to the sky from 1-4 p.m. Tickets are $20 for general admission, $10 for ages 60 and older as well as military members with IDs, $5 for ages 6-17, and free for ages 5 and younger. Tickets and more information are available at bluebonnetairshow.com. Go toimmortalredbaron.com for more on the Immortal Red Baron portion of the program.